By Gabrielle. Photos by Liz Berget for Design Mom. 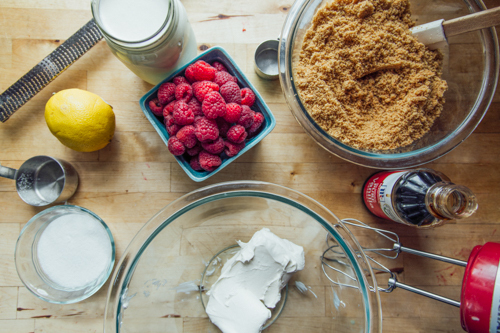 I’m thinking we’re way overdue for a new Dessert for Two recipe, right? 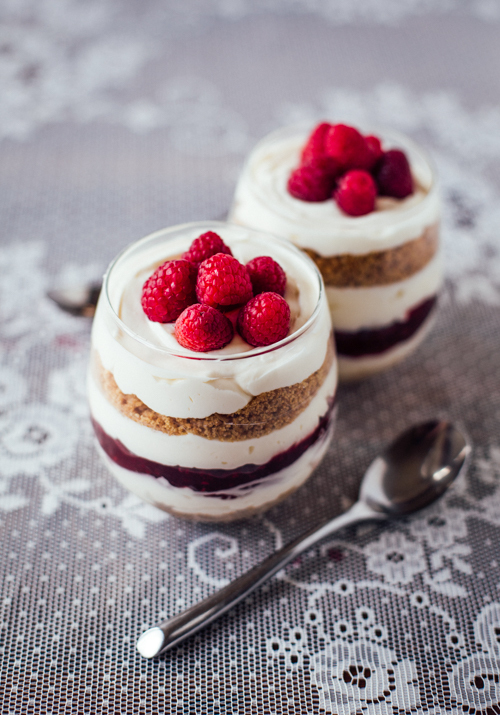 And I’m also thinking that a dessert involving fresh berries sounds like absolute perfection at the moment. No bake? Fresh berries? Cheesecake? 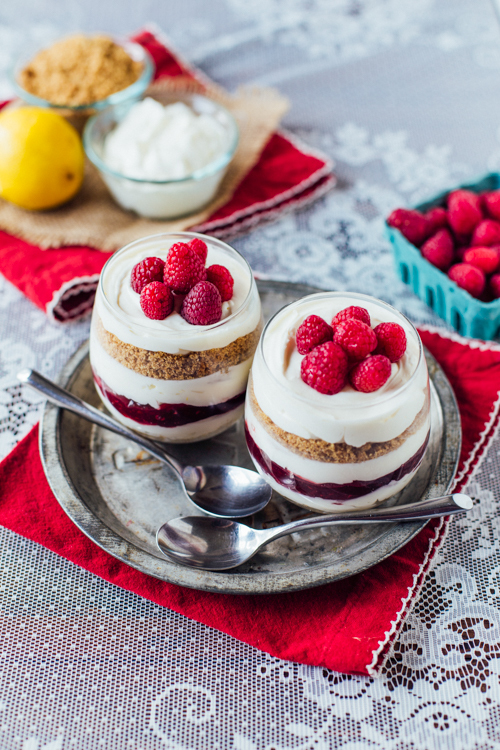 This sort of dessert is right up my alley! I was in Salt Lake City for meetings all day yesterday. I flew out very early in the morning, and flew back late at night. When I arrived home, all I wanted to do was catch up with Ben Blair over a treat. Dessert for two for the win! Speaking of fruity desserts being right up my alley, now I’m curious: When presented with a dessert menu, are you more likely to favor chocolate based desserts, or fruit-based desserts? I definitely favor fruit-based. My second choice would be anything carmel. Ben Blair typically orders chocolate — it’s not my very favorite, but I’m always happy to steal a bite or two. : ) How about you? It seems like spring has finally sprung, and I could not be happier. Last week in Minnesota, we had this ultra-weird day that included sun, relative warmth, clear skies, then clouds, sleet, snow, and wind, mixed with intermittent sun. As I looked out the window at the circus show of weather, I was fairly certain the apocalypse was coming. So, it was a comfort when the snow and sleet faded into nearly 80-degree weather, just in time for the weekend. My family and I celebrated by firing up our grill, wearing shorts and t-shirts (complete with ultra-cool compression tights for this pregnant mama), and heading to the park Saturday morning. As we ate our picnic lunch, I tried telling my three-year-old son about two years ago when our April held two late but beautiful snowstorms, and we hiked through the park taking pictures with him strapped to my back. He just looked at me like I was crazy as he swatted another gnat away from his face and asked when we could go swimming. All this warm weather has me craving summer foods — everything light and easy. I want salads and fresh tomatoes, but mostly I want berries. If I would let myself, I could probably eat a solid pint of strawberries on the daily. And so these desserts. Light and fresh and berrylicious. Let’s talk cheesecake. I’m assuming you love it? Okay. Good. But there are two types of cheesecake eaters in this world. There are those who want their cheesecake slice to act as a sugar-bomb, satisfying every ounce of sweet tooth they have. They top their cheesecakes with syrupy fruits or decadent chocolate and caramel. 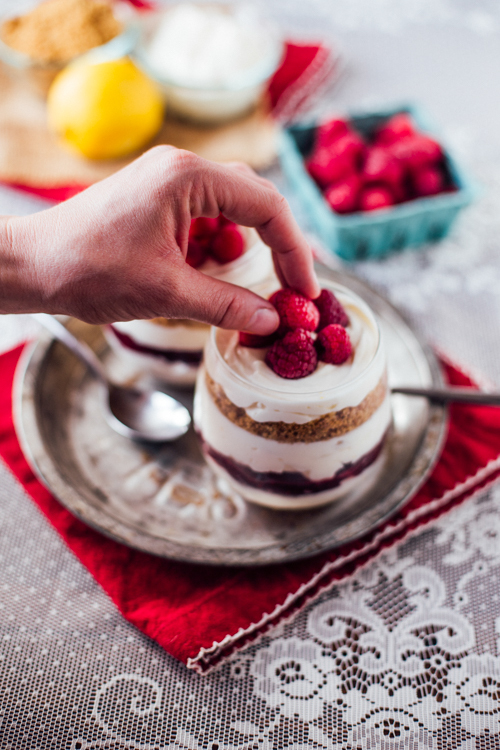 And then there are those who really just want to sit down with a bowl of berries and slightly sweetened freshly whipped cream (possibly because they already had three cookies with their afternoon coffee earlier), and so they want a cheesecake that represents the best of summer freshness. I definitely fall into the latter of those two categories, and this dessert reflects that. It’s as simple to put together as it is fresh-tasting. The graham cracker crust comes together easily, with slight sweetness from both white and brown sugars, giving it a bit more of a sweet depth. The cheesecake mixture is on the fresh side, balanced with a pinch of lemon zest, but still plenty rich with that heavy cream, whipped into goodness. And then the berries come through in a jam layer as well as fresh berries on top. I assembled these in several layers. I really wanted a crust layer in the middle because it’s one of my very favorite parts of a cheesecake, and I wanted a little crust in every bite; I didn’t want to have to dig my way to the bottom. 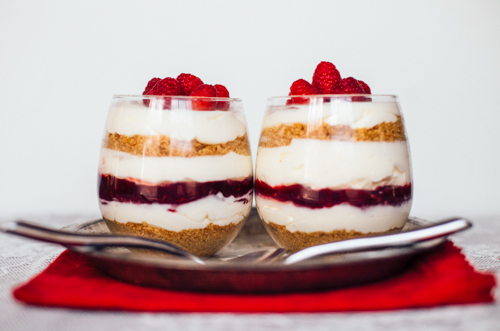 These no-bake cheesecake jars are perfect for a summer night, for you and the one you love to sit by your backyard fire, cheesecake cups and spoons in hand, maybe a glass of red wine nearby. They are perfect for an afternoon with a friend, and I may or may not have eaten a portion of one of my test runs of these along with my morning coffee. And if your kids happen to glimpse these chilling in the fridge, they will beg and beg to try these little pretties until you cave and whip up another easy batch to share with them. *Get a block of cream cheese, and be sure not to use a tub of cream cheese spread. 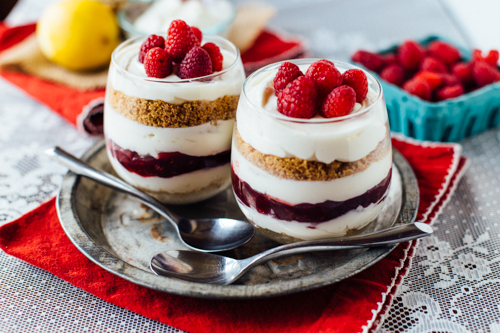 **I prefer a fresher, lighter cheesecake that’s berry driven, but if you’re looking to satisfy a serious sweet tooth, use up to 3 tablespoons sugar in the cheesecake mixture. You could also use an additional tablespoon of brown sugar in the crust. 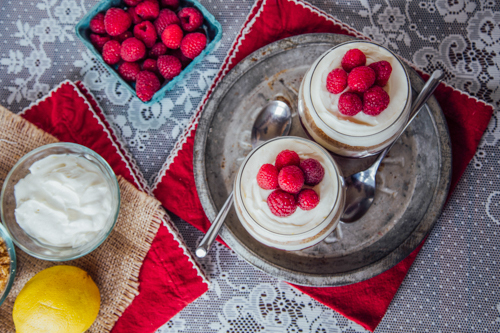 ***Don’t limit yourself to raspberries here; the summer produce world is your oyster: your berries and jam could be strawberry, blueberry, or blackberry…or a mixture of one kind of a jam and a different kind of berry. I think these would also be excellent with peach or apricot jam, topped with fresh peaches! ****I used a barely sweetened jam and loved the results, but again, if you’re looking for something super sweet, you might want to look for a jam with a higher sugar content. 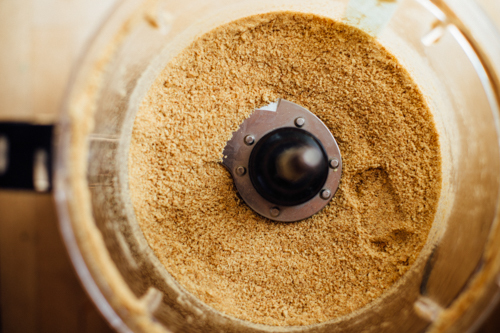 For the Crust: Grind your graham crackers into fine crumbs using a food processor. Add melted butter and white and brown sugars and pulse several times until you have a coarse, sandy mixture. (Alternately, you can place the crackers in a ziploc bag and use a rolling pin to crush them finely. Then just transfer the crumbs to a bowl and stir in your melted butter and sugars.) Set aside. 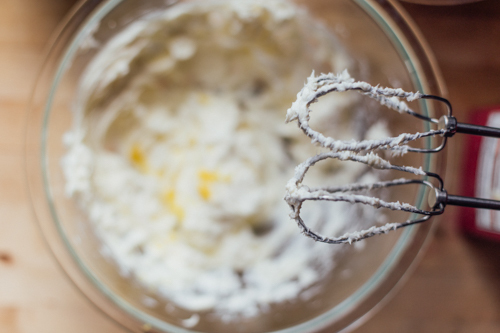 For the Cheesecake: Place softened cream cheese, lemon zest, vanilla extract, granulated sugar, and heavy cream in a large bowl. Starting on the lowest speed to avoid splatter, blend thoroughly (scraping down sides as needed) until mixture is thick and stiff. The portions of your layers will totally depend on the size of your glass cup. The measurements given here reflected the size of the stemless wine glasses I used, but please adjust accordingly if you’re using something larger or smaller! Also – If you’re aiming for beauty and not speed here, you’ll want to use a paper towel to wipe down the sides of the glass after spreading each layer. Layer 1: ¼ cup of graham cracker crust. Press into the bottom of the cup with a narrow bowl or cup, or use your fingers. Layer 2: about ½ cup of cheesecake mixture. Use a spoon or small rubber spatula to smooth this layer and press it all the way to the edge of the glass; do your best not to mix the crust layer up into this layer. Layer 3: ½ cup jam. Smooth to the edges. Layer 4: ½ cup cheese cake mixture. 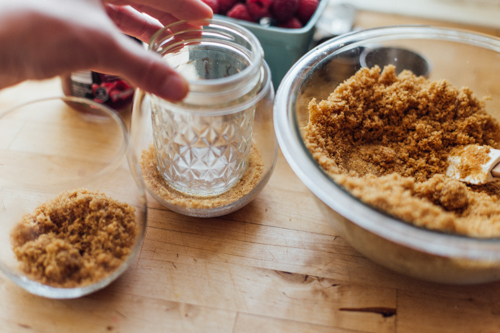 Use a spoon or small rubber spatula to smooth this layer and press it all the way to the edge of the glass; do your best not to mix the jam layer up into this layer. Layer 5: heaping ¼ cup graham cracker crust. Gently spread with your fingers, and lightly press. Layer 6: ⅓ cup of cheesecake mixture. Use a spoon or small rubber spatula to smooth this layer and press it all the way to the edge of the glass; do your best not to mix the crust layer up into this layer. Refrigerate for at least 1 hour, ideally 3 — or up to a day before enjoying! Thank you, Liz! This is pretty much the perfect dessert in my opinion. Gorgeous to look at. Delicious. Rich. Not too sweet. Thank you for adding some fruity goodness to the Dessert for Two column! Credits: Images, styling & recipe by Liz Berget. Assistance by Amy Christie. What a simple, yummy looking treat! I love that all the ingredients are things I already have on hand. Thanks for another great one!